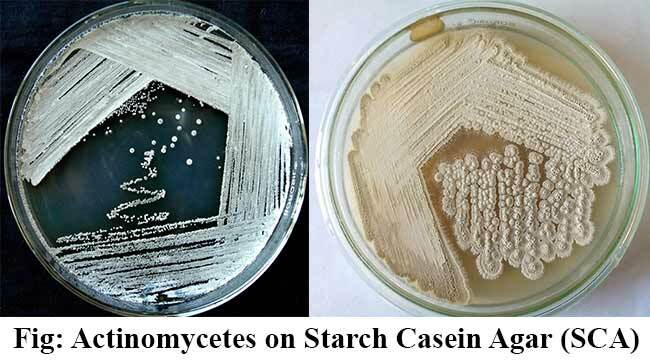 Starch Casein Agar (SCA) is used for the detection of saccharolytic marine bacteria and mostly actinomycetes. Actinomycetes are a fungi-like bacteria forming long filaments that stretch through the soil. They are large group of gram positive filamentous and/ or branching bacilli. Actinomycetes have been isolated from terrestrial sources, although the first report of mycelium forming actinomycetes being recovered from marine sediments appeared several decades ago. Marine sediments are known potential sources for isolation of novel actinomycetes yielding new products and are recognized as source of novel antibiotic and anticancer agents. The actinomycetes have an extensive impact on the environment by decomposing and transforming a wide variety of complex organic residues. Actinomycetes thus represent an important group of microbes found in environment and plays significant role not only in therapeutic applications but also on recycling of organic matter. This medium has starch as the complex carbohydrate source and casein as nitrogen source. The salts of seawater provides complex ionic sources that makes the medium suitable for marine microbial flora and also buffers the medium. It is used for the detection of saccharolytic marine bacteria. It is used for the isolation of actinomycetes. Suspend 63.0 grams of Starch Casein Agar in 1000 ml distilled water. Actinomycetes: Off-white to yellow colored homogeneous free flowing powder. Balakrishna, A. Shiva Shanker and Pavan Kumar Pindi. Isolation of Phosphate Solibulizing Actinomycetes from Forest Soils of Mahabubnagar District. IOSR Journal of Pharmacy. Mar.-Apr. 2012, Vol. 2(2) pp: 271-275. Starch Casein Agar. HiMedia Laboratories Pvt. Ltd.
Starch Casein Agar, Culture Media. My Bio Source. Mojtaba Mohseni, Hamed Norouzi, Javad Hamedi, Aboulghasem Roohi. Screening of Antibacterial Producing Actinomycetes from Sediments of the Caspian Sea. IJMCM Original Article Spring 2013, Vol 2, No 2.